A lot’s happened in the past couple of months! Here’s an update on all our various businesses and projects – and info on how we run them while we travel. Sorrrrry! It’s been a long time since we’ve written a blog post. It’s not that we’ve been out of ideas – just that we’ve been out of time. For the past couple of months we’ve been busy getting our acts together – focusing more than ever on doing the work that will be the most successful in the long term. When I last wrote an “update” on our lives and businesses, it was January 2014. So much has changed since then, and many readers have emailed to ask for a breakdown of our various businesses – because a) they’re understandably thoroughly confused, and b) they too would like to start up location independent businesses – and they want to learn from our mistakes! So in this post I aim to both explain what our businesses are and give some insights into the processes and systems that enable us to work on them from anywhere. The Property Podcast is a multiplayer game in which contenders compete for the Golden Watermelon. It’s not really – it’s a podcast about UK property investment. The co-hosts are this Rob (Rob Dix – husband/co-person at Making It Anywhere) and that Rob (Rob Bence – this Rob’s friend and business partner). Every week, The Robs talk about different aspects of property investment – risk, locations, leverage, mortgages, ROI and so on. It really is far more fun that it sounds, and it’s been the UK’s most popular business podcast on UK iTunes for well over a year now. Whereas Rob Bence stays put in the UK, Rob Dix’s intro is usually something like “Hellooooo from Valencia”, “Hiiii from Chiang Mai”, “Hello there; I’m in Budapest this week!”. The recording time stays pretty much constant wherever we happen to be (Friday morning at 7am in the UK), which means that Rob will be having a few very early mornings in New York later this year. The Property Hub came out of The Property Podcast: listeners were eager to have conversations and share advice and tips with fellow listeners, so we set it up. Today, the community has about 2,700 members and it’s completely free for anyone to join. There’s only one way that any money is made out of the community, and that’s through the quarterly Property Hub Summits – each of which is open to only 20 members. The Property Hub has grown incredibly quickly, so we recently hired a PA to help us manage it and coordinate everything for the Summits. So if The Property Podcast and The Property Hub don’t really make any money… what does? 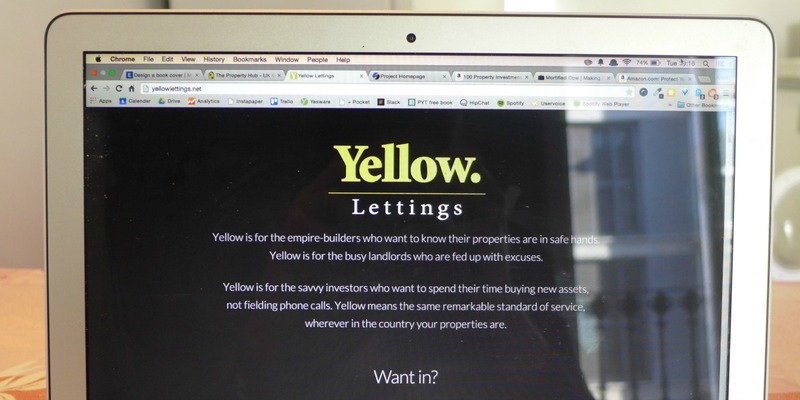 Yellow Lettings is… I’m not sure how to create a joke out of this one. But it’s a nationwide letting and management agency for UK investors. Investors will buy a property and then hand it over to us to manage. Our team rents out the property to tenants, manages those tenants, collects the rent for the investor, and so on. If the toilet overflows or the pipes freeze up, it’s up to Yellow Lettings to sort it out. Yellow Lettings is evidence of a funnel doing some bloody good funnelling. Property Hub readers and Property Podcast listeners grow to trust The Robs and appreciate the valuable advice that they put out there week after week. They can interact with them and other investors through The Hub, and get support and advice whenever they need it. And when they hear about Yellow Lettings, they know they’re in safe hands: they’ve already bought into The Robs’ philosophy and they trust them to do a better job than any other letting agency when it comes to managing their investment. Yellow Lettings grew quickly from the word go, and we’ve put the brakes on accepting new properties while we grow the team and robustify our processes. Over the past few months we’ve hired three members of staff – two to work on lettings and management, and one to work on admin. And we also have contractors in various cities to deal with repairs and upkeep. While we’re only in a few key cities at the moment, we’ll be expanding later in the year. There’s no central office where everyone goes to work each day (it’s a fully distributed team), so processes, standard operating procedures, team chatrooms and regular Skype meetings are crucial. For more information about how we run a distributed team, the software we use and our hiring processes, read this post. Ooh back to the jokes. So, 100 Property Investment Tips is a book all about how to rock the “sarong ‘n’ sweatshirt” look on the beach. No it’s NOT! Silly! It’s a book that contains 100 tips about property investment. Many of the tips came from our most experienced and helpful members of The Property Hub. I then edited those tips and compiled them into a book, which we published on Amazon a couple of weeks ago. The aim of the book was purely lead generation. We’re not looking to make a profit from it – we just want another way for UK property investors to find out about The Property Hub. More members = a better community for everyone and more potential for new Yellow Lettings clients. A detailed promo strategy combined with some very supportive Hub members ensured we made it to #1 in the bestseller list, and we’ve received almost 100 excellent reviews in just two weeks. As for our original intention – lead generation – it seems to have worked. Membership numbers have risen from about eight new members per day to about 16. Something new and surprising will launch in April for The Property Hub. Like the book, the aim is to get people into The Property Hub world. It’s a huge undertaking that’s involved a hiring frenzy and many meetings. When we’re not feeling jittery and wondering what the hell we’ve got ourselves into, we’re extremely excited. We invest in property ourselves, which I probably should have mentioned earlier on: we didn’t just decide to create a podcast, community and books around property because Google’s Keyword Tool told us it’d be a good idea. Last time we were in the UK we set ourselves the task of sourcing two new properties to add to the portfolio, and we ended up with three. We haven’t visited any of them since the sales were completed, but two of them have been extensively refurbished by our team. It’s our copywriting company, and it’s gone through many iterations over the years. It started out as our main money-maker: when we first became digital nomads, we started doing web project management and copywriting for clients because it was all we really knew how to do. Over time we dropped the web project management and became more about branding and copywriting. These days, it’s just copywriting. And we’ve gone from project-based fees to value-based fees to day rates. Yup: we’ve kind of moved in the “wrong” direction when it comes to how we charge our clients. It works for us – not least because copywriting is far from our only gig, so we know the exact reward of giving up a day on one of our own projects. We have between two and three clients at any one time, and we enjoy it: it pays well, we learn about lots of different industries, and we get to work with some wonderful clients. We communicate with clients through Skype, email and Google Docs. We’ve completely dispensed with offline word-processing tools now: Google Docs has improved to the stage where we’re comfortable using it all the time. The “suggestions” function is even better than tracked changes, formatting is great, and there are no version-control issues. Here’s a post that focuses on what you need to know about running a client-facing business from around the world. Until very recently, book writing was a fun side project for both of us: we’d write books when normal people would watch TV. We loved the process of researching something tricky and explaining it in a fun and easy-to-follow way, or writing about something we already knew about. We’ve done pretty well out of it: Rob has two property books, we’ve co-written a successful book about protecting your tech, and there are a few others out there that make a few extra hundred dollars between them each month. I really liked the idea of creating lots more books that would each make money and gradually add up to a sizeable passive income stream. So I’m turning this fun side project into a more serious side business. My first book, Travel Like A Pro, will be out in a few weeks’ time, and I’ve already started to think about the next one. There’s also Property Geek, which is about new trends in biochemical engineering. But I can’t talk any more about it because I’ve used up my quota of the word “property” for the year. And now that’s really it! We’re building up assets and communities that will serve us well for the long term. We’re working on things that thoroughly interest and excite us. For client work, we’ve stripped it back so that we’re only doing the work we love (we never loved web project management). And our fee structure saves us so much time: we don’t write proposals with convoluted tables for project payments, and we don’t have to have any discussions with clients about going “beyond scope”. We’re mega excited about our business plans for the future, and – if you’re interested – we’ll be sure to share with you how they’re going! As soon as we can reveal more about the shiny new project, we will. In the meantime, let me know: how has your business changed over the past few months – or what are you doing differently? Have you found a business approach that’s working well for you at the moment? Let me know in the comments! Posted on March 3, 2015 by Mish @ Making It Anywhere in Building a business.